The Small/Counsineau family stayed at RMHC Manitoba's Ronald McDonald House while their daughter, received life-saving medical treatment. Pictured (from left) are Tyler, Rosalie and Beverly. 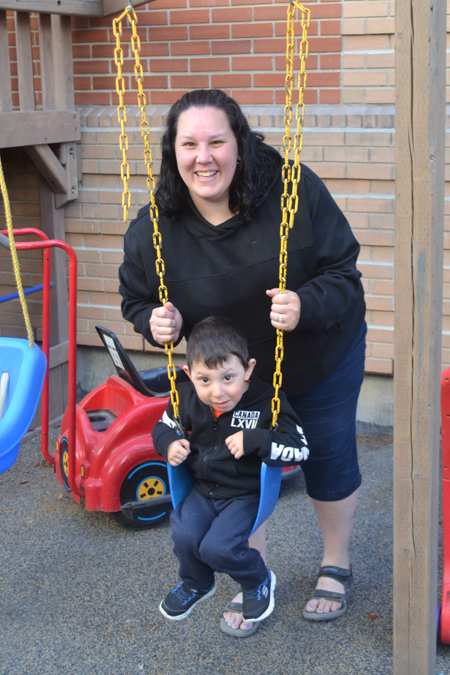 We start our 5 Weeks for Families campaign and celebrate Mother's Day on May 14th with a wonderful story from our advocates, the Small/Cousineau family, from Fort Frances, Ontario. Rosalie Small was born three-and-a-half months before her due date. “I didn't know if she was going to make it. I didn't know if I was going to make it. It was scary. It was terrifying. When I looked at her the first time, all I did was bawl. All you can think about is that she shouldn't have been born. She should have still been in my tummy. You just want to make everything better, but you can't. She was so sick. You just want to pick them up at be like, 'that's it, I'm going home. I don't want to deal with this', but you can't. It's just a mom thing. You can't do anything, but you want to. It's hard. I don't know how many times I've cried after everything we went through. At Ronald McDonald House, you don't feel like you're alone. You are with people and they understand. Some people are going through the same thing as you. You get to meet people and talk about it.